As the UK dental community marks National Smile Month, a key member of the dental team at the University of Plymouth is beaming after receiving her Member of the British Empire (MBE). 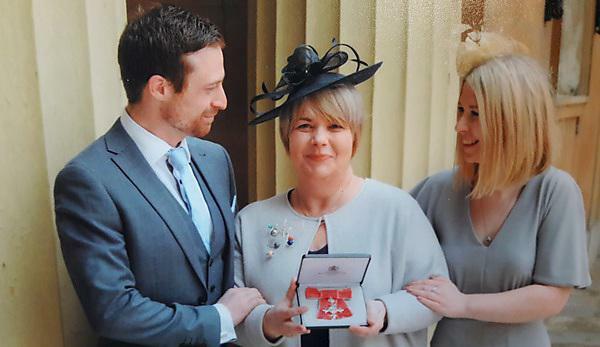 Wendy Smith, Strategic Lead for Community Engagement at the health charity Well Connected, collected her MBE at Buckingham Palace from Prince William for her ‘services to oral health care and dental education in the South West’. Wendy, who was a founding member of the Community Engagement team within the University's Peninsula Dental School, said she felt the experience was ‘completely surreal’ as she attended the ceremony alongside her family. Dedicating the award to ‘all of the students, staff and partners in Peninsula Dental Social Enterprise (PDSE) and Peninsula Dental School’, she said that the day was ‘magical’. National Smile Month is the UK’s largest and longest-running campaign to promote good oral health. Running from 14 May – 14 June, the campaign is led by the Oral Health Foundation. Much of Wendy’s career has been defined by collaborating with groups, individuals and organisations who support those people that face inequality or disadvantage in accessing dental treatment and oral healthcare. Most recently she supported the University’s second-year dental students within their Inter-professional engagement projects, where they worked with a variety of community organisations to deliver oral health messages.